There's been a lot written about Ben Shrewy's food and in the past year the restaurant was awarded two hats from the Good Food Guide and "best new talent" from Gourmet Traveller, so it's about time we got to taste it for ourselves - for us that means the tasting menu! We are both of the opinion that this should really have been offered as an amuse rather than a course of the degustation. 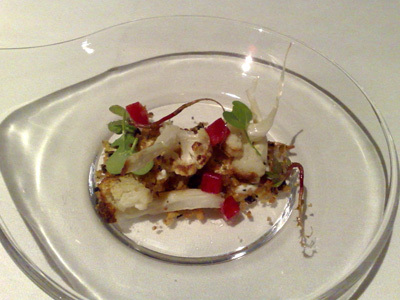 Visually it's an attractive dish - underneath the pieces of sautéed cauliflower lay a ribbon of soft goat cheese. The clove oil flavour was missing in my dish and in Paalo's, there was a hint of it in the last bite. 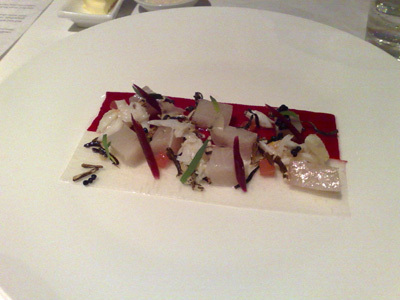 This was a terrific dish although the timing from the kitchen is a bit off - that is one of the recurrent issues of the night, the pacing seemed erratic, with courses appearing anywhere from 5 minutes to 40 minutes apart. 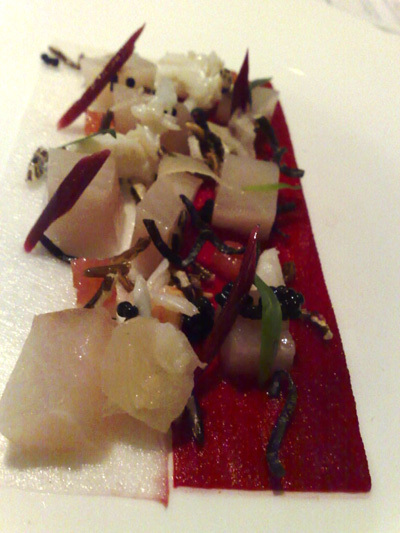 Placed on the base are wide strips of red and white radish topped with cubes of cured kingfish and fresh crabmeat, puffed wild rice, caviar, the tiniest dice of grapefruit and picked tarragon leaves. This arrives at the table without the broth and under a smoke filled dome - as the dome is removed you get that lovely aroma of hickory wafting up. 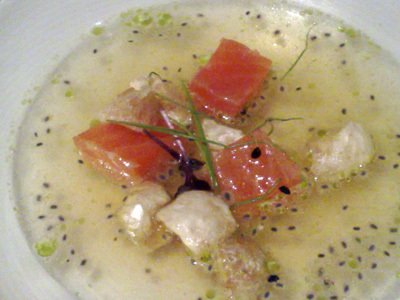 At the bottom of the bowl is the powdered form of sorrel oil, cubes of salmon and pork crackling the other elements. Suspended in the smoked trout broth are basil seeds and as the broth is poured the sorrel powder is reconstituted to form tiny green droplets of sorrel oil that float on the surface. The pork crackling then begins to "snap crackle and pop" on contact with the liquid. Not only a treat for the eyes and the nose but one for the ears as well. One of the best pieces of quail I've eaten. 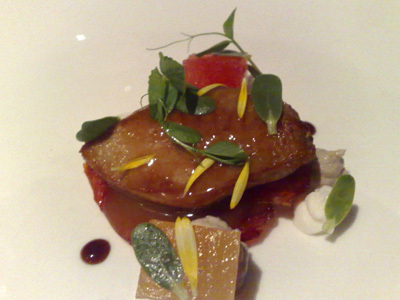 Underneath the quail breast are two wafer thin slices of their chorizo. Lovely to look at and no complaints about the quality of the ingredients or technique but I don't think it's on the same level as a few of the other dishes we've eaten tonight. 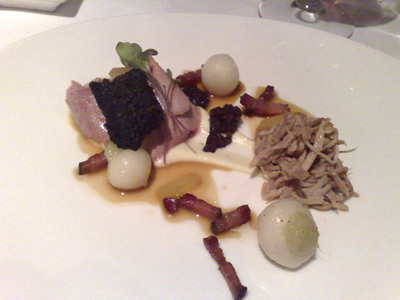 Top left of the plate are slices of slow cooked pork topped with black pudding and they sit upon a smear of cauliflower puree - at the right, is the shredded pork. 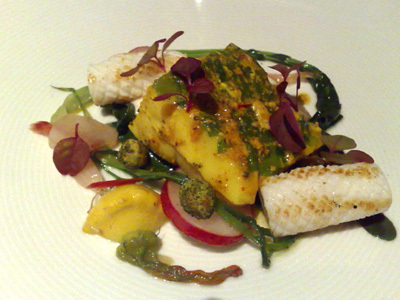 This is quite a substantial dish but well worth savouring as the flavours just work. It would have been nicer if the gap between this course and the previous one had been longer but that doesn't detract from what is a most divine offering. 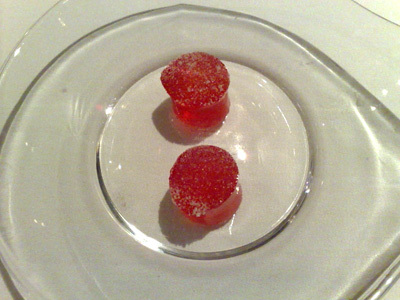 Perched on the top of the glass, acting as a lid, is a circle of thin toffee. 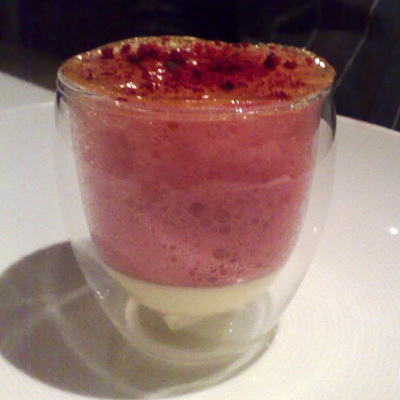 Underneath a airy cloud of plum essence almost hiding the plum compote that sits atop the ultra silky custard. Heaven in a glass. 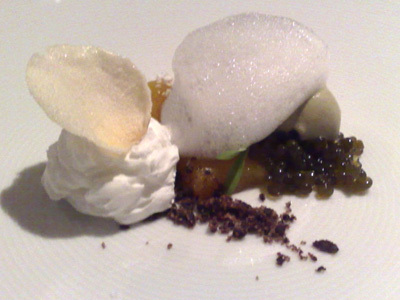 The pineapple has been cooked in a caramel and it sits to the right of the plate amongst a scattering of licorice spheres and a quenelle of licorice ice-cream. The foam topping it looks quite innocuous but it is pure lime. 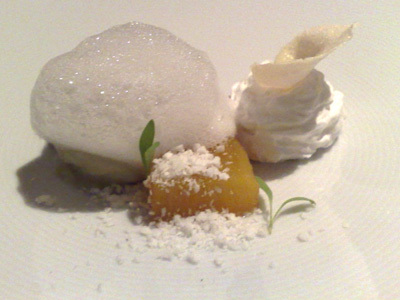 To the left, coconut cream topped with sugared rose petal. Generally speaking, the wine matches were brilliant, they did their job in offering complimentary and contrasting flavours to enhance the dining experience. The food was good to very good but on the night we dined, the timing was off. Service was professional. For reference - on Saturday nights, only the tasting menu is available and is $110 without wine and $185 with wine per person. The a la carte menu is available on the other days.